Place the cloves, allspice, and anise into a medium Sauce Pot and toast over medium heat until fragrant (about 2 minutes). Add the almonds and toast (stirring constantly) for 1 minute (do not brown). Add the Water, Lime Zest, Lemon Skin, and Lemongrass and bring to a boil over medium heat (about 3 minutes), stirring occasionally. Once boiling, add the Sugar, stir to dissolve, and return to a boil. Allow to simmer for 2-3 minutes. Remove from the heat, stir in the ginger, cover, and cool (2-3 hours). Strain through a fine mesh sieve into a medium-sized bowl and add the Rum. Pour into a clean, stopper bottle and refrigerate for up to 6 months. (Yields about 4 Cups). Falernum is sweet and elegant flavor-packed syrup with notes of clove and hints of almond and citrus. A cousin of Orgeat, this sweetener is typically used in Tiki or Caribbean drinks, but consider it in place of simple syrup to liven-up classic cocktails or use it in crazy concoctions like our Beer Flip. There are a few commercially available falernums. 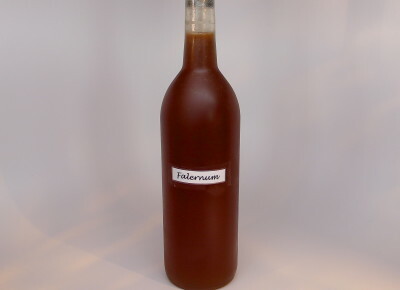 We typically use Taylor’s Velvet Falernum, but consider making your own if you have trouble finding some at your local market or want to tinker a bit and create your own. We prefer a clove-centric syrup with loads of interest and flavor, but not too much citrus. We’re looking for a well-balanced syrup with nice complexity and interest where the citrus just sneaks up and whispers in our ear, not clobbers us on the head. With those ideas in mind, this is a great syrup to experiment with. It is very forgiving, and easy to tweak and make a version that is uniquely yours. 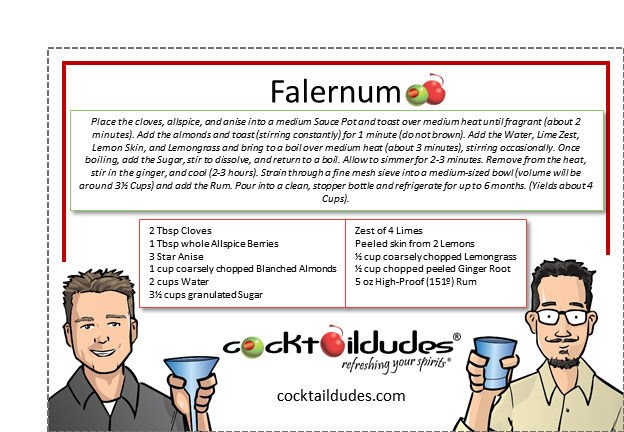 Check out all the Falernum cocktails we utilize it in. Cheers!